I don't know why it happened, but yesterday our daily readership tripled. *UPDATE: We logged 417 readers by Midnight. I can't link it it to any one particular story, although 200 people have read the November 2008 archive. Huh. 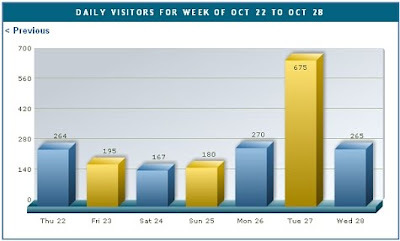 Last November, I mention that the scene averaged a 100 readers a day; how things have changed! I do see that we've been getting a lot of traffic from StumbleUpon.com. Our numbers have been increasing steadily since inception, but this is the biggest one-day leap since we broke the 26th Street Theatre scandal. Whatever the reason, I hope that you enjoy what you find, and that you find something useful.